Energy security has been a top global concern motivating researchers to seek it from renewable and cost-effective resources. Solar cells, that convert sun light into electricity, hold the promise as a cheap energy alternative. The silicon and thin film photovoltaic industry have taken many strides to lower energy prices; however, continued research is required in order to extensively compete with fossil fuels. The development of perovskite solar cells, first reported in 2009 (and with a record power conversion efficiency of 20.1 percent so far), is a possible route towards high efficiency photovoltaics that are also cost-effectiveness, owing to to their easy-processing from solution. Question marks have however remained on their stability. 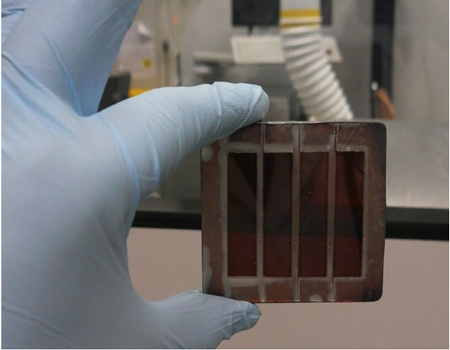 Now, a research team from University Malaysia Pahang, focussing on renewable energy, working in in collaboration with scientists from University of Rome ‘Tor Vergata’, Italy, has developed the world's first nanorod-based perovskite solar module. The findings have been published in the July 24, 2015 online edition of ("Vertical TiO2 Nanorods as a Medium for Stable and High-Efficiency Perovskite Solar Modules"). In addition to high efficiency, these perovskite solar modules also show remarkable and improved shelf life. In fact, the nanostructuring of the photoelectrode brings about great improvement in stability, and especially compared to those without a scaffold layer (planar). Among the three types of electron transport layers investigated, the nanorod-based devices retained the original efficiency values even after 2500 hours of shelf-life investigation, a protocol used to gauge initial stability and indoor lifetime performance. The device employing a conventional TiO2 nanoparticle material showed nearly 60% of original performance, whereas planar devices employing a compact TiO2 layer showed below 5% of original performance, measured at similar experimental conditions. A chemical analysis of the devices hinted that the peculiar conformation of nanorods facilitates a stable perovskite phase due to their inherent stability and macroporous nature. The team leader from University Malaysia Pahang, Rajan Jose, Professor of physics in the Faculty of Industrial Science & Technology, who has been working on nanomaterials for energy applications since 2008 at UMP, calls their findings as a significant milestone in the field of nanotechnology. According to him, although nanorods have been known for over 15 years, their research has been limited to only laboratory scale and producing a large area practical device was the key challenge. However, his team in collaboration with the Centre of Hybrid and Organic Solar Energy (CHOSE) of the University of Rome Tor Vergata, Italy has solved the technology bottleneck by applying a precise laser treatment and via interfacial engineering the nanorods on conducting substrates. Professor Thomas Brown, co-corresponding author of the work (from the University of Rome “Tor Vergata”) and lecturer in organic electronics, said that to his knowledge this is the first time a hybrid solar module with series-connected cells based on nanorod photoelectrodes (and perovskite active layer) has been demonstrated, which shows how a collaboration between the two groups, with synergistic know-how in different areas, can lead to innovations such as the one published in ACS Nano. "The results are very promising and will open a new era of unconventional solar cell technology as perovskite solar modules can also, for example, be made transparent for integrated building application," said Dr. Azhar Fakharuddin who has been a key researcher in this work. "Perovskite solar cells’ efficiency and now their stability progress are very impressive; it took only 5 years to reach efficiency levels that for example took silicon solar cells decades. We are excited about these findings and want to further improve the performance of our solar modules and also have plan to develop this technology on a larger scale for practical applications."